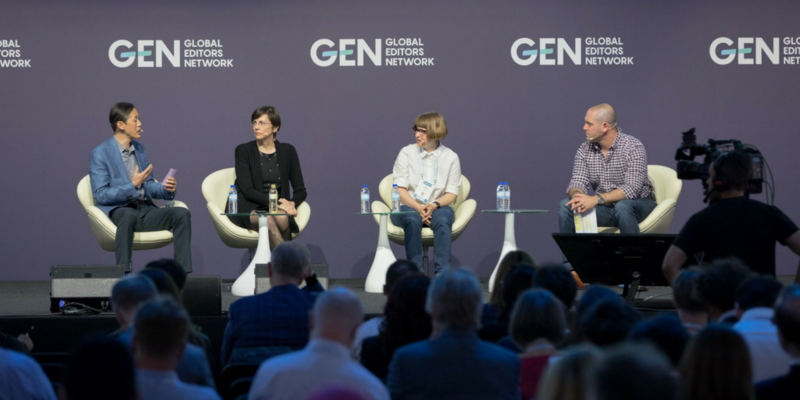 If you weren’t able to spend three days in sunny Lisbon for discussions on media innovation for the Global Editors Network’s GEN Summit, here are the five key insights that you missed. One of the highlights of the event was the keynote session on machine learning from Benedict Evans. He began with listing six unhelpful ways we talk about AI (including calling it AI!). We’re only just in the early stages of this technological revolution. We heard that the biggest uses for new technology are rarely evident at the beginning–no one was talking about ride sharing opportunities when mobile began. The many uses of machine learning in news and media are only just becoming evident. While discussing his newest venture Neva Labs, Mark Little made a great point that while media companies have focused on social media disrupting their business model, the real problem is that social media has gotten readers out of the daily habit of reading digital news. To succeed, publishers need to focus on getting into their readers’ daily routines–something we’ve written about before! You can listen to what others are doing to engage their readers all day, but to best engage your own audience, you need to know their specific habits. Condé Nast’s Sarah Marshall pointed to the cultural differences Vogue faces in each country: Vogue Japan’s readers are most engaged at 22h because that’s when they’re commuting home. Without this knowledge, Vouge Japan would be missing a key time to interact with their core base. For Dagens Nyheter, equal representation of women in their articles is an important focus for their audience–that’s why they developed a bot to tell their journalists on a monthly basis their split of women versus men in the articles. And it’s not just in articles, according to Martin Jönsson the newsroom is now 48% female with only a 2% pay gap. This focus has paid off for them, in the past four years they’ve grown from zero digital subscribers to an equal amount of digital-only and print subscribers. While artificial intelligence is on everyone’s mind, one big concern had emerged: is AI only for big publishers? We saw that small publishers can benefit as well, with examples of newsroom integrating augmented reality in to their story telling. Conversations about tech and journalism must always acknowledge the spectrum of newsroom resources and capacities. Innovation can't be just for big orgs. A theme we’ve heard across different presentations is the importance of the people behind the technology you’re developing. We heard from John Keefe, bot developer for Quartz, that behind really good bots are really good humans. In the same vein, we heard from AP’s Lisa Gibbs how good technology allows humans to do what they do best. For example, Tamedia has developed a feed to collate feeds from local police websites–so instead of a reporter having to check all 20 websites, they only have to check this one feed which gives them more time to dig into the stories they find. Interested in digital publishing? Subscribe for a weekly newsletter on topics such as AI in media, paid content, and the future of news.